"The general population of the religious-Zionist movement is involved in all political affairs. No significant field is foreign to it, and its members have become influential ­– and even leaders in many spheres. The spiritual spectrum among this population is much broader than many think." Impetus for the stalled peace process between Israel and the Palestinians could come from a surprising quarter: the religious-Zionist community. In the latter days of the Hebrew month of Elul, I had a dream that the members of the religious-Zionist movement will become the leaders of public discourse about peace. As with all dreams, it is impossible to explain it fully, and there is also no need to do so. But the deep longing within it can be strongly felt. I do not necessarily mean that a political peace plan of whatever kind will be accepted by rabbis, leaders, educators and activists. I mean that the discussion about the attainment of peace with the Palestinians, and the rest of our neighbors, will become a key topic in the internal discourse, in education and in practical striving: Holding study days about it; devoting Bnei Akiva [youth movement] activities to it; emphasizing the topic in articles and on political platforms – all these will serve the goal. While it is likely that peace is not practically attainable at present – because of the complicated and fluid situation in the Muslim and Arab world, among other things – people of faith never limit themselves to discussing only things that can be realized in the short term. The belief that every human being was created in the divine image, and that war is justifiable only when it is necessary, has deep roots in our tradition. The possibility of living in peace with our neighbors seems vital from any Jewish perspective. It suffices for us to think about the spiritual and material potential that could be released for purposes of education, strengthening the link with our sources, and helping the weak. And this, too: Setting peace as a major goal in study and discussion will refine our emotions and behavior, not to mention the mental and moral liberation from dealing with the lives of others. It is said that some of the bitterest wars are over religious beliefs. Indeed, we cannot ignore that tangible danger – even if the most aggressive leaders of the last century (Hitler, Stalin, Mao) operated in cultures that rejected religious belief. When various Islamic groups cynically and cruelly attempt to use religion to justify destruction and killing, we are obligated still more to separate our Hebrew faith, emphasize the sorrow bound up in the killing of others, and our right and duty to fight only out of the necessity for self-defense. I am fully aware of the head-on collision between possible peace moves and loyalty to the country. I have no desire to rehash the old justifications here, such as the claim that saving lives requires that peace be made, on the one hand, and the fear of severe danger to security requires defensible borders, on the other. What is important to me is that the topic of political, current peace be at the center of awareness and debate in the religious framework. Every believing Jew reviews statements about the value of peace every single day, such as the statement, “Mighty One on high, dwelling in power, You are Peace and Your Name is Peace.” Many interpret the word “peace” as applying to relationships between people within our own nation. That has enormous importance as well, but we must view peace as a relevant value in our relations with neighboring peoples as well. The general population of the religious-Zionist movement is involved in all political affairs. No significant field is foreign to it, and its members have become influential ­– and even leaders in many spheres. The spiritual spectrum among this population is much broader than many think. Topics such as artistic creation and media coverage have become extremely relevant to it, as has the work done by the small groups of religious people who move to a particular location to engage in social and volunteer activity. Some religiously observant people routinely vote for parties that are not religious, while others search tirelessly for emotional and spiritual renewal within the religious framework. All these welcome developments pave the way for new ways of thinking, including about the terrible conflict between Israel and its neighbors. 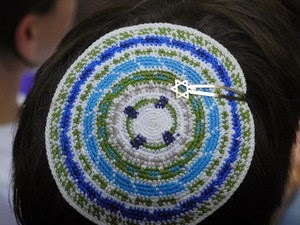 Some will undoubtedly see my statements as cut off from reality, since, after all, the “crocheted skullcap crowd” are not open to new ways of thinking when it comes to peace. Others will say that true peace is not on the agenda at all, so we must build our country and not be drawn into useless debate. But it is precisely because of my binding and profound Jewish faith, and precisely because of the enormous caution we must exercise in all affairs of state, that I feel the need I have described here. As long as the debate over the possibility of peace takes place mainly between various whole sectors within Israel, we are being drawn into extremism and quarrels, in any case. If the debate over peace becomes a major internal topic in the religious-Zionist community, too, we could see surprising results.